Wallace Wien, 88, Fargo, ND, and formerly of Colfax, ND, died on Friday, March 8, 2013 at the Elim Care Center, Fargo, ND. A Family Funeral Service will be Thursday, 2:00 PM at Willow Creek Chapel, Wahpeton, ND. Interment will be at Fairview Memorial Gardens, Wahpeton, in the spring. Arrangements are with the Vertin-Munson Funeral Home, Wahpeton. Wallace was born on June 13, 1924, the son of Gilbert and Marie Wien. He was born on the family farm two miles east of Colfax, ND. He attended and graduated from Colfax High School in 1942. Wallace farmed with his father until 1957 and continued the farming practice with his wife Fern until his retirement in 1986. 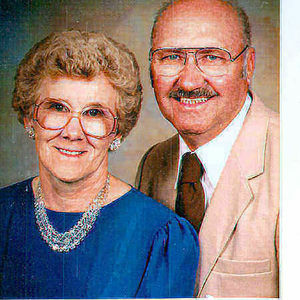 In 1990, Wallace and Fern left the family farm and moved to Fargo, ND. Wallace was a highly skilled welder, mechanic and wood worker. He enjoyed Bison football, a game of cards and the Lawrence Welk Show. The couple celebrated their 70th wedding anniversary last November. Wallace is survived by his wife, Fern; and son, Ronald, both of Fargo, ND; a daughter, Vickie (Carl) Juneau, AK; three grandchildren, three great grandsons, and a sister, Muriel Sampson, Fargo. He was preceded in death by his parents, Gilbert and Marie (Fiske) Wien. Memorials are preferred to Hospice of the Red River Valley or the American Cancer Society. Grandpa,I miss you so much. You will always be with me. I will keep my promise to you and take care of grandma. I am so blessed to have had you in my life. Until we meet again. My sympathy to all of you on Wally's death. I have many fond memories of my high school days spent at the Wien home. May the memories you share as a family sustain you in the days ahead. I remember when we ran out of gas near your farm. Dad walked over to borrow some gas. Of course, Wally was happy to give us a gallon of gas. Afterwards, Dad tried to give Wally a dollar for the gas. They argued for about 10 minutes over whether Wally should take the dollar, but Wally refused to take it. Those were the good old days!